Bored, but resigned, Denham followed Arnold into the dining-room in her grimy overalls. The three guests raised a hub-bub of welcome, of greeting, of inquiry…. She was pale and heavy-faced and sullen, smudged with travel, one cheek bulged out with a peardrop; she was not even attractive. Worse, she understood nothing. Blind and crying, their love groped for a door of entry, and turned away defeated. observations: Isaac is the protagonist’s dog, Arnold is her husband. It is clear which she prefers. So then I got snarky in return – Andorra is not a republic, as Macaulay says several times, it is a principality. (Yes, I am that pedantic.) Actually, I think nearly all the opening section of the book could have been omitted: in which the young girl Denham (what a stupid name), entirely brought up in Majorca and Andorra, is swept up by English relatives and taken to London when her father dies. The book is a satirical view of how Denham (like a Craig Raine Martian) cannot understand a thing about upper middle class arty life amongst the publishers, writers, theatre types and respectable gentry. She stumbles into marriage, and all does not go well, as that very sad last sentence of the extract shows. I read the book because the lovely Leaves and Books blog recommended it, so I soldiered on, and then partway through I suddenly got into the swing of it. You have to stop wondering whether any of the characters are in any way likeable (not really) and just enjoy the culture clash. The book is so odd it will need another entry to cover it – though that’s partly because I found the perfect picture to illustrate another section. Tune in later this week. 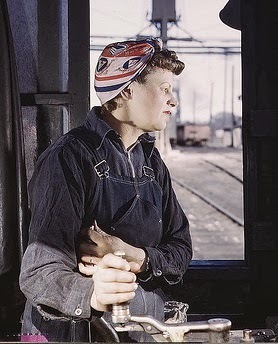 The photos of women in overalls are from the Library of Congress – from a series showing women doing what was thought of as ‘men’s work’ during the Second World War. The woman on a motorbike is a photo used ages ago for this blog entry. I'll probably pass on this one, no big surprise. 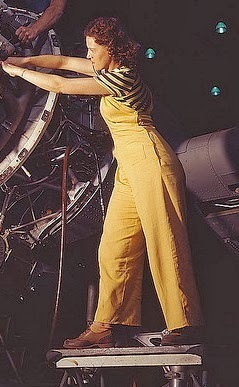 When you mention women in overalls, I automatically think of calendars in garage workshops with a nubile young thing sporting a massive pair of......wait for it.........monkey wrenches whilst spilling out of an oily pair of dungarees. I never claimed to be PC! Oh - those calendars! I well remember those. My bachelor uncle operated a welding shop down in the industrial zone of Williams Lake, BC - then not much more than a dusty ranching community - and on Sundays after church my mother would take us (my sister and I, of tender impressionable age) along to drop off her weekly contribution of home-baked goodies to supplement his own cooking. Uncle Carl's shop walls were liberally decorated with years and years of exceedingly risque calendars from various of his steel and tool suppliers - some of them were popping out of their garments, others had completely emerged, and the girls in question looked completely okay with that, lol. These must have dated from the mid-50s right up into the early 70s - Uncle Carl just keep adding to the collection. Anyway, there was an unspoken rule that we not stare at these when there or mention them later, but as a curious child I must admit that my stolen glances made a deep impression, of I'm not sure what. Mild bemusement, perhaps? Sometime in the late 1970s Uncle Carl built a new shop and those calendars disappeared. A few milder versions were displayed in the new premises, but the gallery was nothing like that of the previous collection. I wonder what became of the old ones? My husband occasionally receives the modern version of these promotional calendars from his own industrial contacts, but as the years have gone by the girls, ever more modestly clad, have completely disappeared from most of them, a reflection of the current PC atmosphere of industry and the ever more diverse blue collar workplace which is trying hard to be inclusive to the women entering the "traditionally male" fields of work. And I'm so glad you struggled on to the end. I am finding Rose Macaulay an interesting and sometimes rather difficult writer - I do not "like" her characters, but I am finding them fascinating, and I have noticed that I think a lot about her stories for long after the time of reading. Crewe Train's Denham is not initially appealing, but by the end of the book I was rather fond of her, and I increasingly enjoyed Macaulay's rather facetious style. Though I wouldn't want to go on a steady diet of her novels, I am looking forward to reading more of them in the years to come. I enjoyed reading your post, Moira, and as usual the pictures you tracked down are marvelous! Moira - I always think culture clash is a fascinating theme in a novel, so I understand what you mean about just appreciating a book on that score. I had to chuckle too at your response to the beginning of the book. I've gotten snarky right back at books too. And hey, it means the book got your attention even if that part of it wasn't good. Oh, sorry to stick my nose in again but I forgot before: did you know Crewe Train is mentioned in Agatha Christie's Murder in Mesopotamia? It's one of the books the victim has on her shelf. Moira; I am back to question another clothed woman. While the woman in the rail yard looks credible I have a hard time believing the photo of the young woman reaching into some huge engine or turbine. In particular, the shoes never passed any safety inspection. They would not even protect her from stubbing her toe. Stylish but I cannot believe they were ever worn on the production line. Why can a publicity shot not actually show real work clothing? I don't know that I will ever try this author, but this is definitely an interesting post. I am glad you stuck with the book and were rewarded, so that you could share it with us. Thanks Tracy - it was an interesting (if not top-notch) read, and I'm glad it provoked some good discussions above.